Black-headed Caiques. Pets held on hands. Caiques (pronounced khy-eeks) are brightly colored, energetic, and entertaining birds that are small when making comparisons in the parrot world, but have big personalities and a lot of love to give to their humans. Here are 5 reasons you can't go wrong when considering a Caique Parrot as a pet. Colorful-The division of color on these birds is so striking it almost looks as if an artist used a paintbrush to execute it so perfectly. Black Headed Caiques (BHC) have black beaks and gray feet, shiny black heads, a festive and well-defined ban of orange around the neck area; their backs and tails are a velvety forest green, their legs, and feathers under the tail are orange, and their bellies are snowy white. 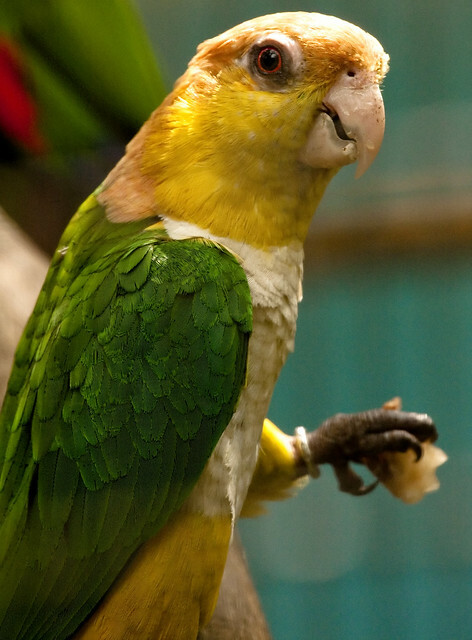 The White Bellied Caique (WBC) differs slightly in coloration with a light-colored beak, yellow head, green back, thighs, and wings with yellow coloring under the tail. It is slightly smaller and is not as common. There are no noticeable personality differences between species, and any differences are probably more attributable to the individuals. Affordable-Prices for Caiques range between $500 and $1,000 USD with pet stores tending to be on the higher end of the scale. Check with an avian veterinarian or do a looking digging on the internet if you prefer to purchase from a breeder or adopt a slightly older bird. Learn as much as you can about the bird's history, spend time with it, and have it checked by a veterinarian before finalizing the adoption. Great Personality-These are happy birds that, when healthy, are in constant motion. They love playing with their toys (and you should have a large variety) and with their humans. They are affectionate and tend to respond well to anyone who gives frequent attention. They need human interaction, and if you do not have the time to devote to them perhaps another pet would make a better choice. If you are thinking about having 2 to provide social interaction for each other, make sure they are compatible before bringing them home. Whistle Happy Tunes-Even though they speech capability is not that of the African Grey, most are still able to speak with their high pitched voice and be understood. They also able to whistle and can learn songs that they hear. They tend to learn songs better if their human whistles the songs for them first. Standard Diet-They love to eat and their food requirements are simple and uncomplicated. Daily offerings should include fresh fruits and vegetables, pasta, and table foods supplemented with a high-quality pellet mix; and fresh water should always be available. Avoid avocado, chocolate, alcohol, and caffeine as they are toxic to any bird. With proper care, these delightful little birds can live up to 30 years. Caique Parrots are becoming increasingly popular in the pet bird world because of their charming personalities and ability to easily fit into the family. If you are considering a Caique, here are answers to 7 of the most frequently asked questions about these wonderful little parrots. 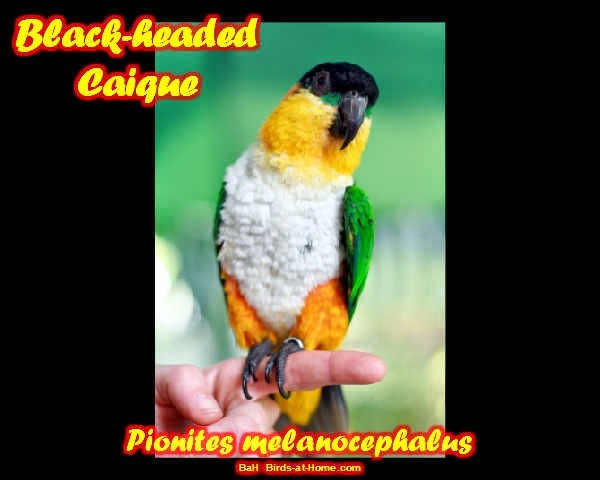 There are 2 main species--the Black Headed Caique (BHC), and the White Bellied Caique (WBC). 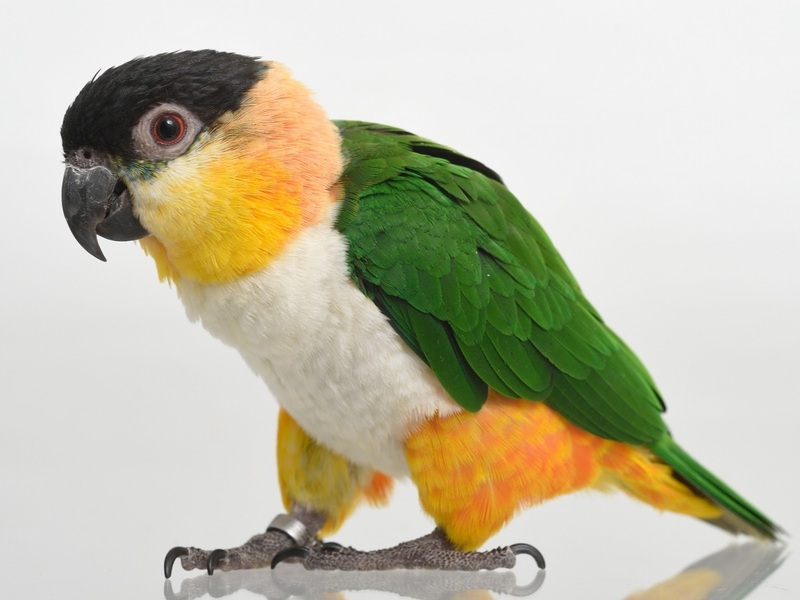 The Black Headed Caique, as you might suspect, has a shiny black head, black beak, and feet, a dark green back, wings, and tail, with orange feathers under the tail and on the legs. It also has a striking band of orange around its neck. The White Bellied Caique is similar except that it has a yellow head, light-colored beak, green legs with yellow feathers under its wings. Both have white bellies. They are both visually striking with no noticeable difference in personality. As adults, they weigh in at approximately 170 grams or 6 ounces and are generally 8 to 9 inches in length. These little birds are surprisingly affordable and cost between $500 and $1000 USD. The Black Headed Caiques are slightly more common and tend to be less expensive than the White Bellied Caiques. This question can produce a different answer from each person you ask so the most accurate answer for you will depend largely on your tolerance level and the individual bird. They can produce a loud screeching sound when they want food or attention from their humans. But this is not usual nor does it last for long periods of time. You can curtail this behavior by covering their cage until they are quiet. A more usual sound is pleasant chattering. Spend time around the bird during different times of day to experience for yourself how loud the bird you're considering really is. Most can learn to speak and enjoy learning to whistle songs. Short training sessions that are frequent, consistent and fun for your bird will produce the best results. However, the only real way to tell whether your bird particular bird will speak or whistle is to hear it do so before you buy it. What kind of cage and toys do they need? Even though they are small birds, they need are fairly large cage because they are so active. The bigger the cage the better, but the minimum size should be 24" high by 24' wide by 24" deep. They love to chew, so be sure to provide a variety of wooden toys and fresh green branches. They also love to be in motion so toys that move are sure to be a hit. Swings, ropes, ladders are all good choices. Inspect toys regularly and remove promptly when they are no longer safe. They should be let out of the cage daily for additional exercise. What are their dietary needs? Caiques love to eat and fortunately, their food needs are simple and uncomplicated. Offer fresh fruits, and vegetables (organic is best to avoid pesticides), sprouted seeds, and table foods, supplemented with a high-quality pellet mix. Make sure fresh water is available constantly. Avoid avocado, caffeine, chocolate, alcohol as they are toxic. 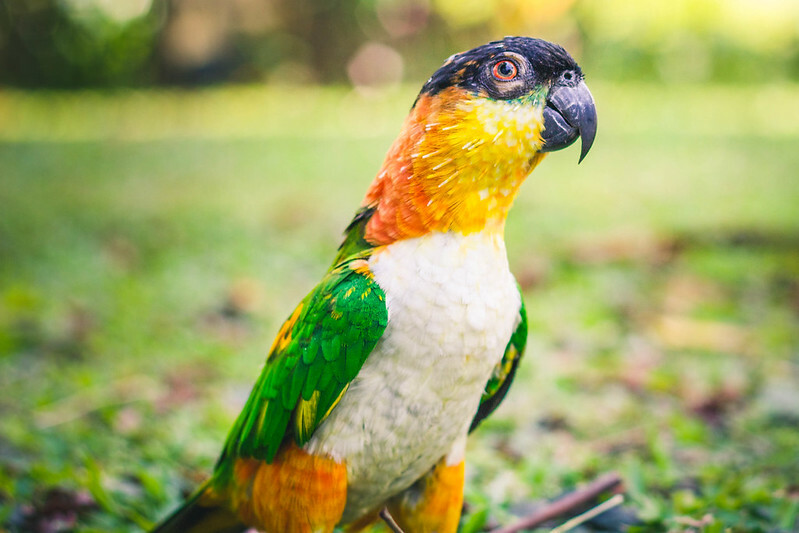 Like many parrots, they are susceptible to airborne diseases and benefit greatly from having their air filtered with a high-efficiency particle arresting (HEPA) air purifier. Caique - Strange name for a parrot isn't it. The correct pronunciation of Caique is: "ky-eek" or "kah-eek." Yes, this word also means a sailing vessel and darned if we know what that has to do with birds (not to be confused with Kayak). They are intelligent, curious, stubborn, affectionate, fearless and devoted. They are sometimes referred to as "clowns" because of their amusing antics. There aren't many parrots that have the same personality with the exception of the Lorikeets/Lories. A Caique may not be the bird for you if you are looking for an excellent talker. Many do learn to talk but they tend to speak in a low almost whispering voice, but; do learn to use words properly, Like-Good Morning, How are you, etc. They do learn to whistle tunes quite well. They are not verbally interactive like Quakers or African Greys, for example. These little birds (either the Black-Capped or White Bellied Caique) are just little playing machines. They love to lie on their backs and play with whiffle balls or other foot toys. They are agile and interactive. They love to be loved and are not noted to be screamers, squawkers or nervous birds. Once introduced to bathing or showering, they absolutely adore it. They will splash and cavort in a glass cake pan or perform their acrobatics while on a birdie shower perch. Showering time can be a great bonding experience for your Caique. Take them in the shower with you. All you need is a good shower perch. Make sure the water isn't too hot and have fun. They love drying off time, just as well. Wrapping them in a fluffy towel before letting them preen is the highlight of their day. Caiques sleep in tree cavities in the wild, and while our pets are several generations from the wild, that need is still there. Provide them with a Birdie Bungalow or a roosting box to sleep in and they will be happy campers. Because these little acrobats love to climb, their cage should be one with more horizontal than vertical bars. The spacing should be no more than 3/4 inch and the cage no less than 24x24x24. They need to move around and enjoy lots of very well supervised out of cage time. A tree made of manzanita or java wood with lots of branches is ideal for them. They benefit from lots of hanging toys and swings to play on. Bringing home baby, and wondering what accessories are essential for your new fids well being? Well, we have got the perfect list to complement your shopping spree. Straight from the recommendations of caique owners are some tried-and-true, accessories and must-haves. We’ve got your back (and your kids, too). The cage- this is the most important aspect of your bird's environment and one that needs the most consideration. Powder coating or stainless steel finish depends on your budget, but no matter the finish, when looking at a cage consider the various aspects. Cage size is recommended at 24 by 36, with less than one-inch bar spacing. Cages that open at the top are not recommended and look for cages that have parallel bars so your bird can easily navigate. The author of this article prefers flat top cages, but it all boils down to personal preference. Food and water dishes that are extended outside of the cage (giving more room within the inside of the cage) are recommended. Perches- a minimum of 5 is recommended. Choose different textures, shapes, and sizes, to give your bird a variety of to perch upon. Caiques like to chew and shred, so natural branches that have bark attached are recommended so the bird can take joy in stripping the perch of its bark. Cholla perches, that are made of a natural cactus material, are also enjoyed. Slick perches like manzanita and dragonwood are not encouraged. Rope perches are a favorite among caiques, as they can bounce and play, chew and rub on the soft cotton material. Food Dishes- stainless steel or ceramic are encouraged. Purchase an extra set so that you can throw the dirty ones in the dishwasher and still have a clean set on hand. Stainless steel dishes are often sold as ‘coop cups’ and can be purchased to fit your already existing food dish holder or come with their own attachment so the cups can be placed strategically within the cage. Caiques have a tendency to enjoy tipping over their food dish, so consider a dish such as the Quick Loc Crock, which literally locks in place. Toys- Caiques love playing with toys- that’s a fact. The brighter, the bolder, the nosier- the better. Quick hint- check out the baby section of your local discount store. Hard plastic keys, teething rings, and rattles are bird safe and caique fun. Tried and true bird toys include the shreddable Parrot Pinatas, the mind-bending Crazy Leather Box, or the chewable Brainiac block. All of these toys challenge your bird's skills and increase activity while elevating boredom. The recommended number of toys is no less than 5 at one time in the bird's cage. With a caique, the more, the better, so don’t be stingy when it comes to playing items. Emergency Medical Kit - If your bird breaks a blood feather, bangs a toenail, or injuries himself in any way, you want to be prepared. Accidents do happen, and caiques seem to be especially accident prone. A good basic medical kit will include self-adhering gauze (vetwrap is a popular choice), clean gauze, tweezers, hemostats, a pair of sharp scissors, antibacterial cream, and a heat pack. Many different types of medical kits are included, and the more comprehensive ones contain everything from emergency hand-feeding formula to forms that include your vet's contact information. The Water Bottle- Caiques are bird chef want-to-be. Their specialty? Parrot stew. Whatever can go in the pot- er, in this cage, water dish- will. It can make providing a clean source of water frustrating at times. Especially when you go to change the water and you wonder why how on earth it turned a bright blue color, and what the heck are those floatie things? Trust me, you don’t want to ask questions. Some caiques, intelligent as they may be, don’t seem to realize that dunking that big chunk of brightly colored wood in the water doesn’t make the wood any easier to chew. There is a solution- water bottles. A water bottle can be hung, providing your pet with a constant source of fresh water, even if he has turned the once clean bowl of water into something less then delightful. When purchasing a water bottle, the recommended ones are made of glass (shy away from thinking plastic ones) and have stainless steel spouts and outfittings. Lixit brand is highly recommended. The Snuggle Buddy- while this is the name of an actual product, in this article we refer to snuggle buddy as anything that your bird likes to sleep next to/in at night. Most caiques enjoy having a ‘happy hut’ type of tent to sleep in at night. There are a variety of tents and huts available for purchase. Looks for one made of long last material such as fleece, with the hanging attachments made of something similar to plastic chain link. Otherwise, the attachments that hold the hut to the cage can be easily chewed through by a bored bird. Other snuggle materials can include fleece swings, large cotton rope toy for the bird to snuggle, and other like materials. Foraging system- Foraging is an important part of your birds wild, natural behavior. While we highly encourage a foraging model feeding system, because this theory and research are still relatively new and mainstream, we are categorizing a foraging system as an ‘accessory’ rather than an immediately required part of your bird's environment. Creative Foraging Systems is a new company that has a fantastic line of feeders and toys that are perfect for caiques. Allowing your bird to work for their food lets them re-create natural behavior that can potentially curb future behavioral issues. You have many options and choices when it comes to foraging, but we most highly recommend a foraging system as the main feeder and an accessory like the ever popular Crazy Maze as a supplemental item. This is just a sampling of items that can be purchased for your bird, and come highly recommended by owners. Look for other articles that include in-depth product reviews, food recommendations, play gym accommodations, and much more.